The Submariner diving watch is one of Rolex's most popular models. The two green models, known among fans as "Kermit" and "Hulk", are especially desirable collector's models that are likely to continue to increase in value. 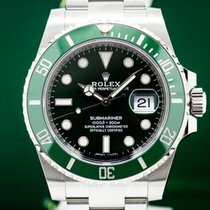 Green dial and/or green bezel with the nicknames "Hulk" & "Kermit"
In 2003, the Rolex Submariner celebrated its 50th anniversary, which the Swiss watch manufacturer honored by releasing a special edition of the world-famous diving watch. While the Submariner had previously only been offered with a black bezel and dial, the bezel of this special model shone in a deep green. Watch enthusiasts and fans quickly gave the watch a nickname befitting its coloration: Kermit. This timepiece can be found under the reference number 16610LV. The Submariner with the reference number 116610LV followed in 2010. Not only did it have a green bezel, it also featured a green dial with a subtle sunburst. Even though it has the same 40-mm diameter, this watch still feels more massive than the Kermit thanks to its bigger lugs and its enlarged crown protector. Fans were once again quick to come up with a nickname for this timepiece, naming it after the green superhero: the Hulk. It's not just the dial colors and cases that set these two models apart: While the Kermit has an aluminum bezel inlay, the Hulk has an inlay made of Rolex's Cerachrom ceramic. This makes the Hulk's bezel much more scratch resistant. Beyond that, these two models are almost identical. Both are made of stainless steel and have a so-called "maxi dial" with enlarged, glow-in-the-dark indices. Each also has a date display with a cyclops lens at 3 o'clock and is powered by the in-house caliber 3135. This caliber has been ticking away inside every Submariner since 1989. 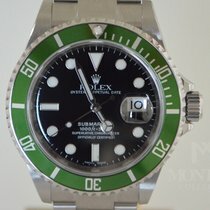 How much does a green Submariner cost? 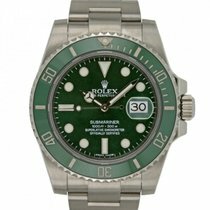 Green Submariners are coveted collector's watches, which are likely to increase in value. This is especially true of the Submariner Kermit ref. 16610LV, as it is no longer available in Rolex's catalog. Be prepared to spend at least 12,000 USD for a pre-owned model. So-called "Flat 4" models were produced from 2003 to 2004 and are recognizable by the flat-topped "4" in the "40" on their bezel. Prices for a pre-owned model in good condition can easily exceed 13,600 USD. A never-worn Kermit costs around 16,400 USD. 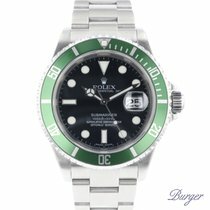 The Submariner Hulk with the reference number 116610LV is a more affordable alternative. You can get a pre-owned example starting at as little as 10,500 USD, while an unworn Hulk costs about 11,400 USD on average. Rolex uses 904L stainless steel for their watches; the monobloc case, screw-down case back, and bracelet are all made of this material. This type of stainless steel is considered more scratch and corrosion resistant than the type 316L. The Triplock crown ensures the watch remains dry. It's screwed down to the case and can be unscrewed to set the time. You can also wind the movement via the crown by hand. The Submariner can easily reach depths unattainable by recreational divers. It is water resistant to 300 m (30 bar, 984 ft) . This makes the Submariner suitable even for professional divers. Those who need to dive even deeper will find that watches in the Rolex Sea-Dweller line are water resistant to 1,220 m (122 bar, 4,000 ft). The Deepsea can even survive up to depths of 3,900 m (390 bar, 12,795 ft). Diving watches must be easy to read in the dark. To facilitate this, the Submariner uses Chromalight, a luminous material developed by Rolex. When dark, it glows blue. Other watch manufacturers use Superluminova, which glows green in the dark. The in-house, automatic caliber 3135 powers both green Submariner models, along with the black or blue date models. The movement is certified precise by the Official Swiss Chronometer Testing Institute (COSC). According to Rolex, the watch deviates from the official time by at most two seconds per day. The caliber has a power reserve of 48 hours.